The first of two upgraded C-5C Super Galaxy aircraft was tested to verify if the aircraft still met the vibroacoustics requirements set forth by NASA Sept. 24, 2015, at Travis Air Force Base, Calif. Travis AFB is home to the Air Force’s only two aircraft specially modified to insert and transport NASA space containers into the aft end of the cargo compartment. Lockheed Martin and base officials recently recorded in-flight noise and vibration data onboard a C-5M Super Galaxy, ensuring the newly upgraded airframe was still compliant with NASA requirements. 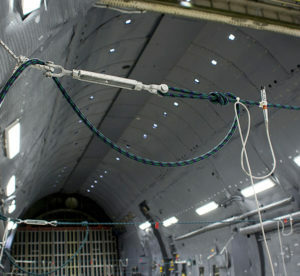 The objective of the test was to collect interior noise and vibration data to verify that the C-5M Space Cargo Modification (SCM) cargo compartment still met the vibroacoustic requirements set forth by NASA, said Brian Austin, a Lockheed Martin representative assigned to the 60th Maintenance Group, Travis Air Force Base, Calif. 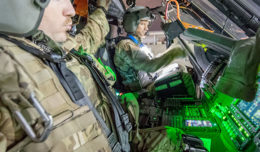 In order to record the data, engineers strategically placed 12 microphones, five single-axis accelerometers and four triaxle accelerometers throughout the aircraft’s specially modified cargo compartment. 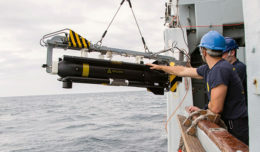 Austin added that while the data gathering facet of this test has been deemed a success, the data is currently being analyzed to verify the aircraft’s compliance. Twelve microphones, five single-axis accelerometers and four triaxle accelerometers were mounted in the cargo compartment of a C-5M Super Galaxy to collect interior noise and vibration data during a flight Sept. 24, 2015, at Travis Air Force Base, Calif.
One of only two C-5Cs, an aircraft specially modified to carry satellites and other large cargo, the aircraft recently returned here after being retrofitted with General Electric CF6-80C2 engines and modernized as part of the C-5M Reliability Enhancement and Re-Engining Program. 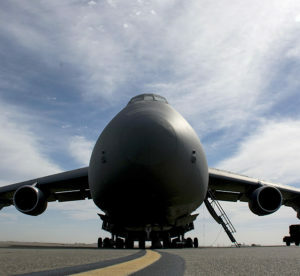 Because the new engines provide the C-5 with 22 percent greater takeoff thrust, potentially altering the vibrations generated within the cargo compartment, Air Force Space Command raised concerns that the aircraft be re-evaluated to verify the aircraft sill met NASA requirements. NASA is currently one of the C-5C’s largest customers and has utilized it to carry satellites, components of the International Space Station and the Hubble Space Telescope. Unlike traditional C-5s, the C-5M-SCM’s aft troop compartment was removed and special modifications were made to the rear loading doors, creating a larger cargo area that can accommodate and transport the Space Container Transportation System. The need to record the vibratory environment of the cargo compartment primarily stems from just how tight the SCTS canister is placed into the airframe. On average, the clearance between the canister and the walls and ceiling of the aircraft is approximately 1 inch, leaving little wiggle room should the cargo shift within flight. 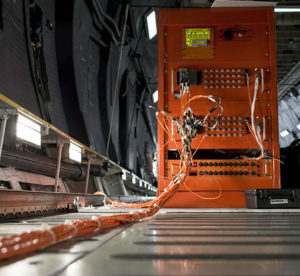 On and off-loading from the aircraft is an operation that can take hours to complete as the canister is basically inched out of the cargo bay. Currently, there is only one C-5M-SCM suitable for SCTS transportation as another one has recently departed to undergo the RERP upgrade and is not slated to return until late 2017.